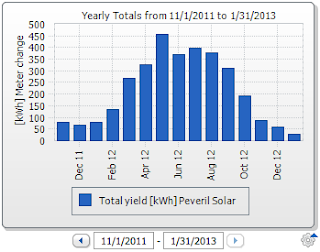 13 Jan 2013: The PV figures for 2012 were severely down on the previous 2 years, and you can see why with these images from the Sunny Portal. June was terrible. The rain that spoilt the Queen's Jubilee Flotilla and countless street parties across the country also cause a massive blip in the PV figures. Instead of being over 500, it was only 360 - and July was bad too. May was good. Sunday has been very sunny, even though we woke up to see snow on the ground around the house. One day, about 4 days previous, the web router was accidentally unplugged, hence the impression that one day earned nothing.